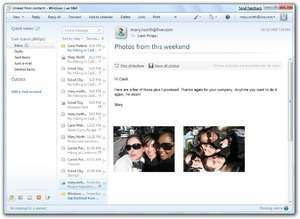 Windows Live Mail brings together multiple e-mail accounts and calendars into one easy-to-use program. Access and edit your e-mail and calendar events, even when you are offline, and sync your changes later. Windows Live Mail helps to maximize your e-mail security across multiple e-mail accounts. Mail combines the ease of use of Outlook Express, with the speed of Windows Live. Version 16.4.3528 is a freeware program which does not have restrictions and it's free so it doesn't cost anything. For security reasons, you should also check out the Windows Live Mail download at LO4D.com which includes virus and malware tests. Additional screenshots of this application download may be available, too. Windows Live Mail download been highly rated by our users.